Valley View's Damian Magallan, Coach of the Year, poses at Valley View High School on Thursday, June 7, 2018, in Pharr. For the team that plays on the blue field, expectations are sky high. Even in arguably the toughest area to qualify for the Class 5A state soccer tournament, the Valley View Tigers enter with a “state or bust” mentality. Coach Damian Magallan’s ability to lead a consistently dangerous group and secure a berth in the state tournament this season earned him The Monitor’s All-Area Coach of the Year honors. 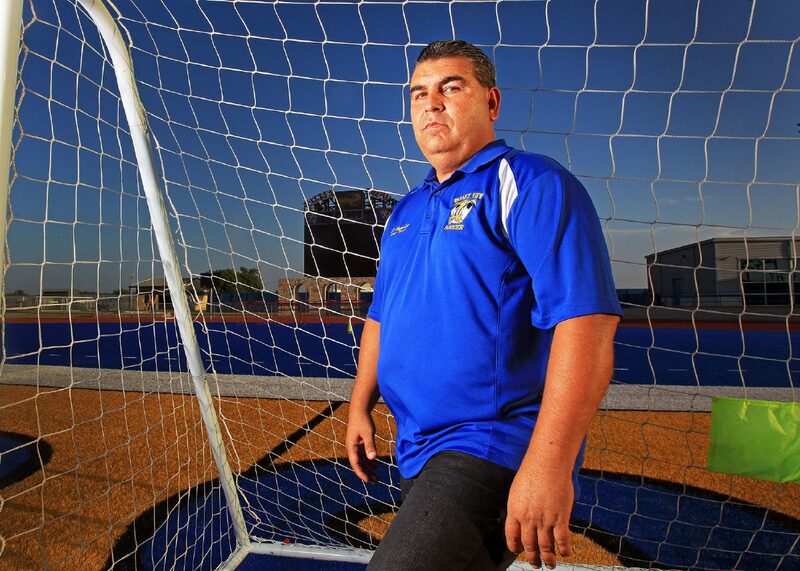 Magallan has been successful in his eight-year tenure at Valley View, but that hasn’t stopped him from learning and developing as a tactician. He embraces those lofty goals and expectations, but his days of relying on a singular star player and just sending him long balls are over. A perfect example was Valley View’s third-round showdown against fellow powerhouse and state regular Brownsville Lopez. De Los Santos got his looks early, but Saldivar scored first before the main striker found his touch. As the game went on and Lopez’s inevitable surge came, Valley View’s composure faltered and two players received red cards. The nine players with tired legs stayed strong to force overtime and eventually penalty kicks, where senior goalie Elian Chavez made two stops and youngster Medina kicked home the winning PK. Lince played his final two years under Magallan alongside Soto on state tournament teams before playing on scholarship at Our Lady of the LakeUniversity. He says playing under Magallan as a junior and a senior was a unique experience. Now, as a young coach himself, he can learn Magallan’s technique and see a new perspective. Lince’s growth under Magallan earned him a role as the junior varsity light head coach — a position that allows him to help build the youth pipeline to the varsity program.